I’ve spent a large part of my career driving the length and breadth of Scotland. That means I know an awful lot of Scotland’s towns and villages only by what I’ve glimpsed from the car while driving through them, on the way to my ultimate destination—which would have been Dumfries, Kilmarnock, Selkirk, Crieff, you name it. That’s particularly true of places on the many roads radiating out of Edinburgh. 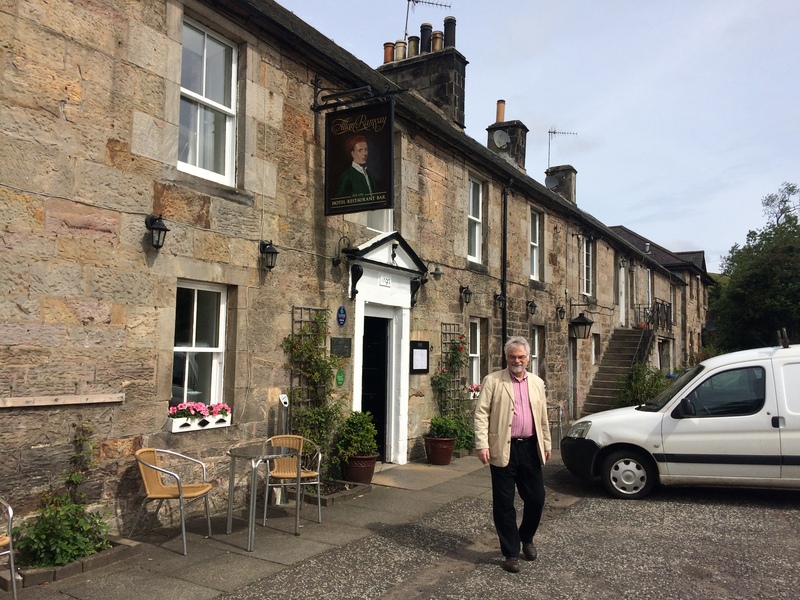 So, a few weeks ago, when we were looking for somewhere to stay the night before attending a friend’s birthday lunch in Balerno, I was rather pleased when Booking.com suggested the Allan Ramsay Hotel in Carlops. Carlops is a tiny village on the A702, which is the scenic route from Edinburgh to Dumfries, so I’d driven past the hotel many times, but never stopped there. It was a risk of course: not all former 18thcentury coaching inns are havens of hospitality and good food; many are barely hanging on, or dependent chiefly on the patronage of a few hard-drinking locals. But the Allan Ramsay turned out to be a total delight. The present landlords only took the place on about three years ago (which makes it doubly unfair that Tripadvisor still carries negative reviews from the previous regime, back in 2014!). And in that time they’ve worked wonders. The bedroom was plain, but comfy: freshly decorated and scrupulously clean. The public areas were welcoming and unfussy, and the dinner really outstanding—good enough that it should encourage Edinburghers to drive out from the city just for the evening; in fact, good enough to persuade us that we should return soon for a long weekend. So many hotels and hostelries across the country have acquired recent names that promote a spurious connection with the past. Our local used to have the good historical name of the ‘Bogroy’, but has for several years been known by the bogus moniker of ‘The Old North Inn’. Years ago, on a pilgrimage to Lerici, where Shelley was living when he drowned, I was depressed to be confronted with the Hotel Byron, the Restaurant di Poeti, and much, much more of the same. But the Allan Ramsay Hotel has borne that name since it was built in 1792, and so may be a very early example—perhaps the first in Scotland—of cashing in on cultural tourism. It’s probably no exaggeration to say, without Ramsay père, there would have been no Burns, no Scott, no Hogg, at least not as we know them. The new landlords of the eponymous hotel knew nothing of this when they took it on, but they decided to find out. The result was an ongoing connection with Glasgow University, and a grant from the ‘Pub is the Hub’ scheme to properly document Ramsay, father and son, in the hotel itself, and to launch an annual Allan Ramsay festival, the third manifestation of which takes place this October. But why Carlops? Why this tiny village, with a history chiefly of weaving and mining, when Ramsay was actually born many miles away in Leadhills and spent most of his life in Edinburgh? The answer lies in Ramsay’s most famous work,The Gentle Shepherd. Among Ramsay’s aristocratic friends and supporters were two local lairds, Alexander Pennecuik of Newhall and that redoubtable Enlightenment figure, Sir John Clerk of Penicuik. Because Ramsay spent much time at those two estates, the setting of his poem/play is very specifically the area round Carlops. Fine, but Ramsay died in 1758—why name a new hotel after him more than 30 years later? Because his fame did not die with him. A new edition of The Gentle Shepherd was published in 1788 with the famous illustrations by David Allan. Another edition followed in 1808, which included a map of all the locations around Carlops mentioned in the poem. So close was the association between play and village that, in the early 1800s, the villagers of Carlops performed The Gentle Shepherd annually on Hansel Monday (the first Monday in January), and charabancs would bring folk out from the city to enjoy the performance. Weather permitting, they could then follow various trails to the sites named in the poem, marked out with stone panels bearing the relevant lines. So why has Ramsay fallen into obscurity? Even in the middle of the 19thcentury he was still famous enough to merit a larger than life-size statue in Princes Street, looking across to his former home in what is now Ramsay Gardens (yes, that’s where it got its name). Judith and I knew about the painter son because we were both trained as art historians. I knew next to nothing about the father before our overnight stay in Carlops. It confirms something I’ve long suspected: that Scotland (and perhaps this is true of all small countries) only has room in its collective memory for a very few iconic figures. So Burns, but not Fergusson, Scott but not Galt or (except for enthusiasts like me) Hogg. Mackintosh, but not Greek Thomson or Lorimer. This is not just a historic problem. Sir James MacMillan may deserve his international fame as a composer, but is he really that much better, or more significant, than his much less widely acclaimed near-contemporaries, Edward McGuire and Alasdair Nicolson, or indeed that marvellous composer who is celebrating her 90thbirthday this year, Thea Musgrave? So three cheers for the Allan Ramsay Hotel, doing its bit to restore Ramsay the poet to his proper place in the Scottish pantheon. It probably helps that two fine contemporary poets, Gerda Stevenson and Aonghas MacNeacail, live in Carlops, and, of course, the village’s location, as one of the entry points to the Pentland Hills Regional Park, makes it doubly attractive as a place to spend a short break. We’ll certainly be back.